I don't need to repurpose old material -- especially for my "On -isms" pieces this month -- but I did think the Black Leopard post was interesting and didn't garner much attention when it first ran. I do quite like the one you pointed to as well, but I ran it here barely six months ago, and that's after it ran in Kirby Collector and on my Patreon. "T'Challa returns to "Black Panther" without comment a few months later back in Avengers. That hardly seems like something that would happen if Thomas himself wanted to make the change based on whatever political and/or creative ideas he himself had." As a child in the early '70s (I turned 8 in 1970), my reading included not only Marvel Comics but also mythology and books about nature and science. FF #119 came out just a few months before I started collecting the FF regularly (with #126 -- I once had earlier issues but my dad had thrown them out in 1971 when we moved from Long Beach, CA, to Salt Lake City). I was also familiar with the Disney version of The Jungle Book, which happened to prominently feature a black panther. 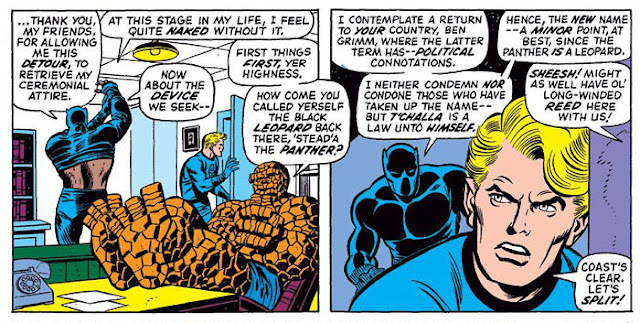 Anyhow, I had heard enough of the news to have heard of the Black Panther Party but for some odd reason I never associated them with the character I read about in the Avengers and later in his own solo series. I would speculate that most other kids of the early '70s were likewise intelligent enough to figure out that both the superhero and the political party were named for the same big cat and that both the superhero and the members of the party happened to black but otherwise, as determined by reading the actual stories featuring the Black Panther, had nothing in common. And even though actual black panthers are really leopards whose fur just happens to appear entirely black rather than an orange-yellow with black spots, the name "black leopard" doesn't quite have the same ring as "black panther". I'm glad Roy dropped that particular idea.